A few days ago, I watched the NASCAR Sprint Cup Daytona 500 on SpeedTV - yes, the whole thing plus hours of pre-race build up. It was an experience that had me thinking on all sorts of levels and, inevitably, the comparison with F1 was my primary interest. This is the series that is always held up to F1 as an example of how to do things differently, after all. So many impressions and thoughts crossed my mind during the race that I may be even more confused than when I started. It was motor racing of a sort, I think, but so far removed from the F1 experience that I am not sure either sport has anything to learn from the other. The only similarity I can think of is that Daytona was like hours of continual slipstreaming along the old straight at Monza without cornering in between. Back in the days when such things were possible at Monza, there might be five or six cars swapping places as they hurtled down the straight; it was stirring stuff and produced some of the closest finishes ever known in F1. But at Daytona, almost the entire field went round in a tightly-packed bunch, all slipstreaming each other and jostling for position from beginning to end. That means over thirty cars in a 200mph traffic jam - and that demands incredible bravery from the drivers. It also means that the race becomes a lottery. It seemed to me that the quickest driver out there was Kyle Busch and he duly led the first thirty laps or so (no mean feat when your closest competitor is just inches away from your tail and has the benefit of the draft). Come the pit stops and safety car periods, however, he lost his lead and was rarely heard from again. Instead there was a series of leaders, determined mainly by luck in the timing of others' crashes and pit stops, and the winner was the guy (Matt Kenseth - no, I had never heard of him before either) who happened to be in the lead when rain stopped the race. I would guess that not all NASCAR races are as much of a lottery as this one was. The fact that there are star drivers who do most of the winning illustrates that there is more to it than just luck. But good fortune plays far more of a part than it does in F1 - get a bad pit stop in NASCAR and you're done. This was particularly noticeable if you were following the ex-F1 drivers in the race. Scott Speed started from 35th place and spent the entire time gradually moving up the order (as high as 24th at one point), only to be knocked back down again by some incident or other. He finished 35th - small reward for many hours of fighting through the pack, although his prize money of $268,763 must have been some consolation (Kenseth gained $1,530,388). Suddenly it becomes clear why none of these drivers may ever be lured into F1! Montoya's progress was even more yoyo-like than Speed's - starting 8th, he fell back initially, then climbed rapidly before incidents that buried him in the pack again. His final position of 14th would have been very different had the race been stopped on almost any other lap. The net result of all this is that I have to re-think the usual criticisms of F1. The overwhelming cry from fans over the last few years has been for more overtaking but NASCAR shows that it is much more the type of overtaking that matters. In every lap of the Daytona 500 there was passing throughout the field, so much so that it became irrelevant and merely made the scrolling position list jump around a bit. F1's scarcity of overtaking maneuvers actually makes each one more valuable, more indicative of ability on the part of the driver, so that we can discuss a single passing move for weeks afterwards. Another common criticism is that F1 is predictable and it is certainly true that, during the Schumacher years, a bet on Michael was almost certain to be rewarded. Yet I suspect that this is still better than any prediction being the wild guess that it must be in NASCAR. Things have improved in F1 anyway, the last couple of years being much harder to predict than previously. Try picking the champion for 2009 and the likelihood is that you'll be wrong. And that leaves me with the TV coverage - something that NASCAR is said to get so much better. I have to say that I like the scrolling position list; it is much easier to follow a driver a few places down from the leaders with this constantly available feature. The driver's radio snippets were also more numerous (and more humorous) than F1's occasional forays into such territory. Other than that, however, I think F1 does as good a job in its telecasts. NASCAR drivers are supposed to be more accessible to the fans and so they are - if you're at the circuit. On TV the driver coverage is thin, interviews being short and lacking depth. And having the drivers perform little antics for the cameras with added animations just seems to trivialize their skills and achievements. Interest in technical aspects of the cars is virtually nil, unsurprisingly considering how close they are in spec and performance. All things considered, I have to conclude that the two forms of motor racing are so different that it is unfair to compare them to each other. It is like comparing F1 with rallying - different aims, different solutions and different appeals to the viewer. As an F1 fan, I am baffled by NASCAR racing but must shrug and say, "chacun à son goût" (each to his own). Which reminds me - I found a Brit food site a while back and yesterday treated myself to a Marmite sandwich! I alwasy seem to catch the Daytona 500, make a note to keep an eye on more NASCAR races during the course of the season, then never see any more. My complaint about the racing is that it's predictably unpredictable: as you say, who wins is as much a lottery as anything else. I get the impression that is less the case with races other than Daytona and the other restrictor plate events, but they're apparently content to see their blue-riband race decided in such an unsatisfying way. But the TV coverage, incessant in-commentary advertising aside, is second to none. HD, technical insight, tons of cameras, knowledgeable pundits... Hope the man from the BBC was taking notes. 1)	'Rubbin' is Racin' means it is sometimes OK to pretend you got onto the brakes late and consequently knocked your main competitor into the wall (the ambiguity associated with this behavior causes some to receive penalties while others don't... sounds familiar). 2)	I've said this before, but it is worth repeating. Technical news revolves around who was caught altering their car (cheating) and what the penalty was for doing so. Light to hefty fines and suspended crew chiefs are the usual penalties. As you say, Clive, the amount of passing doesn't really add to the spectacle either. So the question in my mind is what people are drawn to. The only answer I can come up with is the personalities. They are colorful... and if you draw out that premise, NASCAR, the drivers, and the teams start to look like a reality show centered around racing. The only thing that is really interesting in a reality show is misbehavior... so you end up with big personalities and lots of controversy. But I'm not a fan, and I'm not trying to pass judgement. After all F1 has its own version of a reality show in Max, Bernie, and the (alleged) Ferrari favoritism. I'm sure there are a few crossover fans who could explain the appeal, although I wouldn't blame them for not wanting to raise their hands for fear of being flayed alive. Let me suggest for you guys to try to see Ifineon and Watkins Glen races. They are usually pretty good ands very different from the average NASCAR race. I enjoy Nascar, altough I don't watch it every week (two roomates and only one TV and the poor guys have already to put with me for F1, GP2, IRL and DTM, so adding a four hour weekly engagement that often starts at the time of their beloved sunday football is a big no here). There's a certain amount of luck involved, but not as much as people often think. The problem is that the races are ridiculous overlong so with 500 miles almost every week , the first two tirds of every race aren't very important. All drivers know they have to do well in the firtst 350/400 miles and then try to go for the win in the final 150/100 miles. Kenseth win had a lot to do with luck as the race was stopped due to rain (which happens a lot more than it should), but the guy did start in 43rd (he got punished for changing the car) and got to 1st without any huge luck about pits or yellow flags, so a good deal of skill had to play a part too. Kyle Busch was the faster guy for sure, but you make it sounds worse than it actually were. Busch led 50 of the first 57 laps when he lost the lead for the first time and he was taken out of the race after that big one that Dale Jr created somewhere around laps 120-130. I'm pretty sure he went back at the top at least twice till them and given that the final sheet said he lead 88 laps, he still had to lead around half of his ramaning laps after losing the lead for the first time. Much more lead changes than one sees in F1 (Busch leading 50 straight laps must have bore many fans), but his overall race arc ain't that different from the F1 driver that start a race looking very dom9inaht and them sees his performance slowing a little after the first pits stop. For all the differences between F1 and Nascar (and there's certainly many), I do think there's still some things that are very true to all forms of racing. Think of Daytona like the American Superbowl. Incredible amount of hype, but the restrictor plate racing takes the fun out of it. The restrictor plates cause these massive rush hour like packs. It also leads to "the big one" like we saw caused by Jr. due to the bunching up. Watch one of the road course races, or even a short track to get a better feel for the type of racing that is possible. If you want to see a group out of their element YouTube last year's Nationwide race in Montreal, in the rain, it was something else. The tires were ten years old, and may of the cars had no provisions for wipers. That being said Clive you are right it is a different type of racing, but it is racing. Keith: My TV is not HD-capable so it makes no difference to me whatever transmission is received. I confess that I noticed no technical information in the build-up and driver interviews were often trivial at best - about on the level of a hasty grid walk by Martin Brundle. Perhaps I missed the best bits (entirely possible, since I often wandered away for more coffee, something to munch on, etc.). I, too, intend to catch the rest of the NASCAR season if I can, not least because I have thoughts of doing a regular "Keep up with Scott Speed" thing this year. Marc: That says it all, really - "The only thing that is really interesting in a reality show is misbehavior". How true and how applicable too often to motor sport! The big pile-up caused by Earnhardt's little whoopsie was probably the main event during the race (it was also the cause of Scott Speed losing out big time) but I decided not to mention it because outsiders already think that people just watch NASCAR to see the crashes - and I think that is unfair. In the end, it probably is a personality thing more than anything else. Which would explain why I fail to understand - I have never been into personality cults. Good grief, are you still reading this four-wheeled rubbish, Mad? I remember when cart put air dams on the rear spoilers. This created nearly as many leaders per race as in nascar. I was of the opinion that they wrecked the racing with this. The restrictor plate does the same thing in nascar. I forget just who said it, probably one of the old boys, that it was like racing taxicabs. I think all racing has suffered from mature technology. In the old days everyone's limitations were more or less natural, physically. Today we have to make so many rules to keep the cars limits from becoming lethal. I remember Cale Yarborough fist fighting with Donny Allison, then having Bobby Allison join in. in the infield after they collided on the last lap of Daytona one year. Another year one of the teams made a 7/8 size ford torino and nearly got away with it. These guys were characters to say the least. Then again so was John Cooper, and if you ever see a copy of "The Grad Prix Carpetbaggers" it is well worth the price. Cooper rented a car from a rental company while at the US GP who's motto was "pick it up where you want it, leave it where you want to", so he left it at the bottom of his hotel swimming pool. I guess the rock stars didn't invent such behaviour after all. Nick: It's a good point that so many limits are put on modern cars to prevent them exceeding human capabilities. Maybe we should accept that and find better ways to do it than to make all the cars the same. Nascar isn't what is once was. The rules have been manipulated for TV ratings and die-hard race fans like myself no longer like the 'show' Nascar puts on. Their fans are mainly people who only follow Nascar and know nothing about other forms of racing. Modern day Nascar fans actually like the 'lottery' and not knowing the victor until the last lap. They do not believe the team who prepares the best deserves to win, they would rather be surprised by the outcome. "oh, the same driver led the last 250 laps and the race was over at half distance". That is because they did their job correctly. Isn't the object of racing to BEAT the competition and have the best car? I do believe real oval racing does take some skill. I prefer Sprint cars and midgets on a fast dirt track! It reminds me much of European Rally racing, all car control and who the bravest driver is. I'm surprised with the popularity of rally racing, it hasn't caught on in Europe. The Aussies love their Sprint car and Midget racing! A typical sprint car is 1200 lbs and 800 hp of alcohol injected, V8 power racing on a dirt track only inches away from your competition. The midget is the little brother to the sprint car. 900 lbs and 400 hp with an inline four powering the car. Once you attend a World Of Outlaws sprint car race live...you will be hooked by the drivers skill and car control they have. Whoa, Aracer! Let me try to get my head round NASCAR before I start looking at other things! As was said above the goal at Daytona is to survive until the last pitstop, then put your best effort into the final stint. What you saw wasn't really racing because they weren't far enough along yet. As in F1 there are dominate teams: Joe Gibbs racing (Kyle Busch), Jack Roush racing (Kenseth) and Hendrick Racing (Gordon, Johnson, Earnhardt). Each team has other drivers too and the smaller teams like Redbull, Earnhardt, Penske etc will pick up a win or two every year. 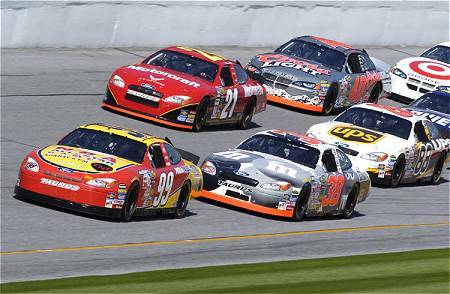 Restrictor plate racing is a long drafting session because the cars don't have enough power to break away. In the old days 4 to 6 cars would get out in front and pull away because they were slightly better than the rest, but not any more. Luck has very little to do with pitstops, the best teams hire people to do nothing but pitstops and they train 5-6 days a week doing it over and over, watching film of themselves, and refining their technique. There was a huge scandle a few years ago when another team hired Gordon's entire pit crew out from under him. The cars are actually faster at tracks like Charlotte or California (next week), but NASCAR got scared when Bill Elliot qualified for Daytona at about 212 mph so the plate was born. One of the best stories was about Smoky Yunick. He was famous for "bending" the rules so when he came to tech NASCAR really went over it with a fine tooth comb including removing the fuel tank to measure it. They handed him a list of infractions 29 items long, he looked at it in disgust and with the fuel tank on the floor, started the car, yelled "make it an even 30" and drove it away. Try to catch a short track or road course event and maybe it will be a little more clear. Clive: I think the trick to limiting things would be to have one person in the pits with a slow jack. If it took 3 minutes or so to change a tire it probably wouldn't be feasible to have tires that molt their marbles all over the place. If rules can make pit stops so expensive time wise, the tires will have to last the whole race. Massive down force will no longer be the way to go and the smoothest driver who can get the best out of the car without wrecking the tires will be in a good place to win. i like both forms of racing...because...they are different! Rob, you're absolutely right. It is like comparing apples and oranges. The main parallel is that both have evolved from what they were, to being less in some ways. Throughout most of the series' lives the evolution was rules changing as people died. I guess the speed with which things were happening became too quick for the car or driver so new rules were applied. Each new rule was a single event, rarely being taken into context with the sum of the preceding rules and the overall direction of each sport. The evolutionary direction changed when the onus became cash and the combined forces of racing, survival and selling the product have come into conflict. Most racing series have there merits, from slalom, through SCCA run offs all the way to the top. In my opinion, they are all fundamentally games though, and sadly, the closer they get to large amounts of money, the more limiting the rules become. When large amounts of cash are in question, people get greedy and nervous (witness Ecclestone) and fiddly. At this point the input of the TV programmer and advertiser become part of the equation. At this point the major influences would seem to be the money factors more than the racing lovers'. When there are panels of people making decisions about things of which they know little about the basics, you end up with problems like GM or British Leyland. Perhaps the dinosaurs died out because they just became too darn big!! Lonny: Ah, there we have it - a good outline of how to begin to understand NASCAR. This was a large part of my writing the article in the first place, to get my commenters to educate me on what is really going on in the races. I thought I'd just tell it the way I saw it and learn from all the responses I was bound to get. It has worked, too! Thanks, Lonny - I'll take your advice on the races to watch. Nick: Bernie would never hear of the slow jack and one man wheel change team - it would spoil the show, he would cry! But how about if we just ban pit stops for tyre changes? Nick: Or maybe the meteor that is supposed to have killed off the dinosaurs has arrived for F1 in the form of the credit crunch! And to be more relevant--the one thing NASCAR knows and F1 could learn from is merchandising. In my part of the world (at the very edge of what is seriously Steeler Nation), where NASCAR is hugely popular, everyone has NASCAR gear. They do a good job of making it fairly high quality yet available to the masses. Bernie has no idea how much free exposure he could get for F1 if he made decent stuff at a reasonable price. It's like paying people to advertise for you. Duh! I am with Nick on the tyre changing point. I have argued for years that F1 should effectively ban pit stops as Clive suggests but you have to allow someone with a puncture or an out of balance wheel to change it so the only way to do that is to limit the number of mechanics who can work on the car. In an ideal world I would only allow one mechanic to do that but to avoid discarded wheels finding their way on to the fast lane of the pits I would have one guy with a wheel gun and an assistant. If you want to change all four wheels go ahead but it is going to take at least a minute. I would insist that the mechanics remained behind the line until the car stopped and was jacked up and that the mechanics could only take one wheel over the line at a time and could only take a second after the first wheel removed had been taken back over the line. I have been mulling over another thought for a couple of days and I hardly dare think it but at least it should stir up some more discussion. We all know that cars can't race and overtake because of all the aero bits and particulary the front wings. Over the years I have considered all sorts of ways of sorting this from banning wings or banning end plates and then an idea struck me that would royally screw up the ability of the front of the car to generate downforce and so give us back racing. I am fastening my crash helmet before I suggest it as I am sure it will not be well received by myself as well as others. The one way to guarantee that downforce cannot be generated in significant quantities on the nose of a car is to increase the cross-sectional area and the way to do that is to stick the engine in the nose. I know I said it would not be well received but the first four times I tried to post it I got a server error. I didn't expect the site to object automatically. Mad sure has written some clever software. I'd second Lonny's post that we really missed out on the true nature of Daytona due to the weather--the last 20 laps or so are when everyone shows their cards, fights all out for the win, and more often than not, chaos erupts. One of the great pleasures of the plate tracks in particular is watching as everyone's best laid plans are rewarded or ruined here. This is when a driver with a superior car who decides to hang back for the first 450 miles to take care of it can suddenly drive a train to the front of the pack; but if he waits too late to make his move, he may find himself caught up in the chaos and unable to advance his position. This is when the drivers, having spent the last three hours feeling each other out, figuring out who has the best cars, figuring out who's willing to work with them or not, must choose their final alliances--who to follow in the draft, who has the equipment to push them to the front--or break them. As Lonny said, it's a shame that the fans were denied this payoff on Sunday. I would add to it by noting that the plate spec and format of Daytona places a premium on racecraft; and I would argue that it's not the unpredictability of Daytona that Nascar fans crave, but that racecraft is the determining factor. This may lead to unpredictability, but it doesn't render the decisions that the drivers make meaningless; on the contrary, when it comes down to the final few laps, it magnifies their significance. You're right that at Daytona a pass is almost meaningless--it's not a matter of oubraking or outcornering someone else. But what is spectacularly important is making the right moves with the right friends at the right time in the draft. I know how F1 fans will talk about a single overtaking maneuver for weeks; while Nascar fans may not have single overtake from Daytona in mind, the equivalent is talking about how a driver managed to hook up with his teammates on the final lap, bumpdrafting their way through the field; or how a driver second in line on the inside saw the outside lane having momentum and decided to jump out in front of it to ride it past the leader. You're right, it's not about driving the car faster than everyone else, it's about "seeing the air" and having a feel for the dynamics of the pack--who has momentum, how you can build momentum with friends by drafting and bumpdrafting, stealing it away from someone coming up alongside you by sidedrafting and giving him a blast of dirty air, etc. I think one of the difficulties for non-fans to follow the action at Daytona is because so much of the action comes down to the drivers making decisions about who to trust and managing their relationships with each other. Who are the pushers, and who are the beneficiaries? For the diehard fans, the on-track politics can be delicious. For example, Dale Jr., has such a reputation as one of the best plate racers that he can command instant help. He had such a poor race on Sunday we didn't get to see it, but one of the most common sights at the end of a plate race is Dale Jr switching lanes all by himself, breaking out of his line. Instantly, a dozen cars will break out and form a new line behind him, pushing him to the front and trying to follow him there. Earning his trust is a huge badge of honor. He likes Montoya--at the last fall race at Talladega, he singled him out as a great bump drafter, and they often work together, as they did when Montoya pushed him into the lead in the qualifying race last Thursday. Interestingly though, Montoya is one of the people who does most of the pushing--he rarely gets help from others (due, no doubt, to his accident-prone aggressiveness early in his Nascar career). Montoya's emerged as one of the bravest plate racers--at Talladega last spring, the new COT made it possible for the most courageous drivers to start pushing each other not just on the straights, but through the corners as well. Montoya and Kyle Busch were one of the first to make this move work in the race, and it quickly became apparent that instead of needing a whole line of cars to make it to the front, two cars hooked up on the outside lane could motor past the entire pack right to the front. This is an interesting tactic that may prove very important--it's definitely something to keep an eye on if you watch the Dega race. Mark: You really did a great job describing what makes a NASCAR race interesting. Your description of it had me dialed in. I have watched a few of the road course races, but I am always struck by the ungainly nature of those cars trying to navigate a chicane, whereas on a speedway they look light and nimble (by comparison). I'm not saying I'm ready to dive in, but I have a better appreciation for the dynamic nature of the tactics and alliances. The size of the car also plays into the racing. You cannot go 10/10ths all the time. You must be very careful not to overheat the tires or the brakes. On a short track 4 or 5 laps of all out running can mean 50 laps of mushy brakes or gripless tires. Even on a superspeedway, the tires can go away very quickly if they are not managed properly. And the driver in front, like Busch last week often looks dominate because he's getting clean air to the splitter for front downforce. Everyone else is getting dirty air, and aero push. I once scorned NASCAR, but if you study it a bit, it's more subtle than it appears. KathrynS: You're right, there is much that could be done regarding merchandise in F1. Bernie is regarded as the great financial wizard by many but he doesn't half miss some obvious chances! Steven: I agree regarding the pit stops for tyre changes. And, when I meet the server error on commenting, I find the best thing to do is reverse quickly, copy the text of the comment, leave the comments system and start again. That always works for me. As for putting the engine in the front, I have thought of that before, believe it or not. During the ground effect era, it struck me that having the engine in front would allow for much more efficient venturi effects underneath the car, probably enough to compensate for the less than ideal weight distribution. Nobody tried it in those days but it does mean that the idea is not complete anathema to me! Today's innovation becomes tomorrow's orthodoxy - it was ever so. Mark: Thank you for such a clear and extensive exposition on the nuances of NASCAR driving. I feel much more able to detect and appreciate what is going on in the races now and am looking forward to my next forays into the NASCAR fields as a result! By luck I had actually copied the comment so as soon as I hit a problem I opened a word doc and dumped the comment there. In the end F5 sorted the server issue. The other reason I was thinking about front engines was to address one of the few sensible things Max has ever said. He is complaining that teams spend a fortune on gaining tiny amounts of time making minor changes. Well of course they do as they have been working on the same problem for decades. If you stick the engine in the front they have a whole new problem to deal with. It would also be more road relevant but that should have nothing to do with racing. I am still not sure I would accept a front engined car as there is something right about the engine being behind the driver. From a safety as well as performance point of view. Like people have said, you only see pack racing at Daytona and Talladega--the short tracks like Bristol, Martinsville, and Richmond are something else altogether. But as far as the plate tracks go, I came across this article about the dynamics of drafting and pack racing at the plate tracks--it goes into much more detail. It's quite old, so some of the info is a bit outdated (the tactic of getting a rival loose by closing up on his back bumper in a corner to take the the air off his spoiler and reduce his downforce is much less effective now that the spoiler has been replaced with a high rear wing), but it's spot on otherwise. Steven: I started following F1 just after the rear engine revolution so I understand what you mean when you say it seems the natural way to go. But the big changes in racing are made by the engineers who come up with completely new ways of looking at the problem - John Cooper's rear-engined cars changed the sport for ever afterwards and Chapman's thoughts on aerodynamics have given us the cars we know today. I would say that a sudden revolution in thinking is long overdue and requires only that the regulations ease up a bit in certain areas. And front engines could come back if we weren't so tied to the present format. Mark: Excellent article - thanks. It makes me a whole lot more respectful of NASCAR drivers in general and I can see too why Montoya did not take the series by storm. Dang, I think I could get into this! I have to agree with Aracerdude...sprint cars. There is nothing like sitting in the stands and getting hit by dirt throw up by the cars, as they go by, to feel a part of the race. Its just a different kind of racing, e.g. F1, stock car, salon, etc. Clive and Steven: I was struck by the thought of putting the engine in the front when I saw how far forward the center of gravity seems to be. You can see it when they pick up the cars with the strap through the engine intake. It looks like the bias is toward the front of the car where it used to be more toward the rear. This may have to do with the grip levels being limited by the grooved tires, but there may be a matter of dynamics that makes forward weight bias an advantage. So maybe a forward engine would be OK from an engineering point of view. Pat: I come from Coventry which was once the center of Britain's motor industry. The city's chosen form of motor sport was something we called speedway - motor bikes racing on a dirt oval, sliding all the way. The local team was the Coventry Bees, a major force in the sport in its great days, and I have watched the races at their stadium. It is just as you say, dirt in the face and noise and excitement. Speedway has been in decline for many years and the Bees are no longer the force they once were. But it does illustrate the fact that Europeans have their dirt tracks too and know a little about being part of the show! Marc: There has to be a moment in the development of F1 when matters of weight distribution make it better to put the engine in the front. Whichever team realizes this first is going to have a useful advantage while the others catch up. "There has to be a moment in the development of F1 when matters of weight distribution make it better to put the engine in the front. Whichever team realizes this first is going to have a useful advantage while the others catch up." Assuming the rules allow it, of course - which I doubt. Seems unlikely, doesn't it, Journeyer? Yet these things tend to go in cycles - we get periods when regulations are very tight and others when circumstances force them to be freed up. It won't happen for a while but we should remember that even Max will not live forever. Actually Dad the Bees are resurgent and won the European championship last year! Nascar also has rather unique radio coverage where the commentators are stationed at each end of the oval and have this amazing banter between each other as they follow the field around. Their back-and-forth is more interesting than the race itself in most cases. Otherwise, Nascar bothers me most because the people I want to win tend to do poorly, and the rule changes they make accent what is poor about their product instead of what could make it more interesting. It's hard to argue with the money, though. I would still rather watch Indy on ovals than Nascar. Their cars seem awkward and they use low tech like pushrods and shims where someone in single-seaters would use a computer and design a system that adjusts with ratchets, but now that their cars are designed to use aerodynamics and ground effect it's pretty much the same sport in heavy, awkward cars. Mad: Just shows how out of date I can get in a few years! Last I heard, the Bees were about down and out. Chunter: Somewhere this week I saw a delightful quote on the subject: "NASCAR is on the cutting edge of yesterday's technology..." Formula 1 Blog has a great podcast up at the moment on the Daytona 500 - well worth a listen.